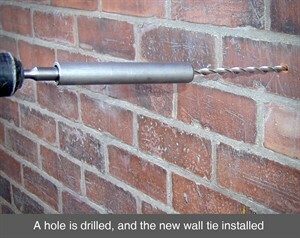 The helical, stainless steel wall ties are quickly and easily installed; a hole is drilled and the wall tie is effectively screwed into the masonry wall, firmly holding the 2 skins of masonry together. 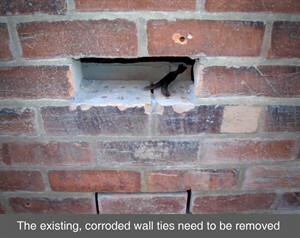 Once the new wall ties have been installed, the old wall ties must be removed to stop further bowing, bulging and brickwork cracking. This normally can be done entirely from the outside; our operator will cut out the brick beside the existing tie, remove the tie and then replace the existing brick. At Stronghold Preservation, as part of our design and specification process, we may carry out a load test survey, to determine the minimum pull out load obtainable. 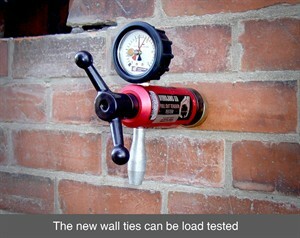 This data will then be used to inform our surveyors as to the optimum solution. Depending on the severity of the wall tie failure, and any associated cracks in walls, remedial work may be required to provide lateral restraint, or to repair any cracks in the walls, using a crack stitching or Cintec anchor method. At Stronghold Preservation, we may provide an insurance backed guarantee for wall tie replacement.